In my last apocalyptic article, I presented computer-generated imagery as a threat to the photographic image, but what can be so dangerous with CGI? As previously discussed, Terminator 2: Judgment Day, James Cameron stages a duel between these two forms of images, CGI vs moving photography. The T-1000 (Robert Patrick), the new Terminator made of liquid metal, is an almost perfect representation of CGI: the T-1000 can morph with its environment or imitate a human body, and he’s a fluid entity, able to metamorphose into almost any shape he wants. Just like CGI, the T-1000 exhibits the appearances of the real object he transforms into, but it’s no more than that, an appearance, because he’s unbound by most of the physical laws that would normally defined this object; the T-1000 looks like reality, but does not act at all like reality as we know it (he can pass through metal bars or reconstitute itself once melted). This is as far as the comparison can go though, because the robot is still a concrete being, made of metal, unlike CGI and its nature as digital information living in some hard drive. Even so, Cameron found in the T-1000 an apt representation of the metamorphic abilities of CGI and its desire to imitate the realism of the photographic image. In one of the most frightening scene of the movie, the T-1000 becomes the floor behind an unsuspecting guard in the asylum: for a moment, we perceive him as if he was a real floor, just like a floor in a movie can be made with CGI. The T-1000 acted as a sort of prophecy about the future of the CGI image, a prediction now fully realized: we cannot know anymore if the environments the characters move in are a real, physical space, a digitally created one, or a mix of both. Nowadays, all floors may hide a T-1000. On the opposite front, there’s the original Terminator (Arnold Schwarzenegger), a big, slow, solid machine that moves through space and time following the same physical laws as we do… except for the time travel part, but I mean that he has to move from one place to another by using his legs moving at a natural speed, or that he cannot walk through a wall except by breaking it. In comparison with the T-1000, he’s an artefact from the past, a glorious reminder of an obsolete technology. Actually, he may not be so obsolete, since the Terminator, the old-school special effects conceived around the particularity of the photographic image, destroys the T-1000, the evil CGI. In this way, the movie explicitly argues for the pre-eminence of the photographic over CGI – but at the same time, Terminator 2 was an obvious showcase for the possibilities of CGI, a technological landmark in this domain. I have no proof other than my own experience for this, but I’m pretty sure that in the mind of the audience (and the movie industry), the T-1000 made a greater impression than the Terminator. In the fiction, the T-1000 came from the future in order to erase the past, and indeed, for the audience, he was a vision of the future, of what movies could become; maybe we didn’t immediately understood, though, that this new technology does create an image without a past, which complicates, when incorporated into film, our perception of the photographic image as a “world past”. A world past… : “The reality in a photograph is present to me while I am not present to it; a world I know, and see, but to which I am nevertheless not present (through no fault of my subjectivity), is a world past.” This quote from Stanley Cavell, in his book The World Viewed, an ontology of cinema, is our best starting point: cinema as a perception of time. Essentially, cinema as a “world past” means that viewing moving photographic images (and Cavell had no other image in mind since he wrote his book in 1971) is the present experience of a past time. In our modern over-familiarity with images (and screens) of all kinds, we tend to forget the profound strangeness of experiencing something that is at once there and not there. Before the advent of photography, in order to perceive a subject, we had to be in presence of this subject. The telescope already allowed the perception of an object that was spatially distant from the perceiver, but photographs were even more alien because the objects we see in a photograph are also distant from us temporally. In a single shot of a movie, it is true that we are in presence of a geographically distant space, but this doesn’t seem so bizarre: in theory, I can always bridge such a spatial gap by going on the location where the movie was shot. As far as this place may be, I know it still exists and that it’s possible to go there, even if the means to do so are not accessible for me. But if I go there, what I will find now is not the same as what it was then, when the movie was shot, and this temporal gap is insurmountable. Film puts us in presence of a past time: an overlapping, in our perception, of the present time with a lived time. With film, we can experience (again and again) a slice of time, as it already happened; it allows an infinite repetition of a unique occurrence, of something “that could never be repeated existentially” (Roland Barthes, in Camera Lucida). With space, there’s a clearer delimitation between the space the spectator occupy (the theatre) and the space represented in the movie, confined by the frame, and by the screen in front of the audience. This is not so true with time: both the present time of the viewing and the past time of the events represented are taking place simultaneously, and they both have the same duration (again, in the case of a single, unedited shot; it gets more complicated with editing). We can differentiate these two times conceptually, but in truth we experience them in unison. What we experience, then, in a movie, first and foremost, is the passage of time – a “sculpture in time” wrote Tarkovsky (or, since it’s a loose translation of his book title, a “depicted time”). A world past… then what about the world? As Cavell wrote, “A photograph does not present us with “likenesses” of things; it presents us, we want to say, with the things themselves. But wanting to say that may well make us ontologically unrest.” What does he mean by those last words? This quote is more complex than it looks, so let’s unravel it from the beginning: when Cavell speaks of “the things themselves”, he doesn’t mean that photographs present a perfect reproduction of their real subjects. As I briefly explained before, because of the mechanical way cameras print reality into film, we tend to believe that photographic images offer an objective reproduction of reality: what we see now is the same as what happened then, or so we assume. Although this indifferent mechanism of the movie camera plays a role here, it is not exactly what Cavell is after: we want to say that photographs are the “things themselves”, but it doesn’t mean that they are entirely one and the same (which would be absurd), or even that we believe that they are; rather, it means that we are absent from this world that we see and recognize, and that we long to be part of it. Film re-presents the world, but we are forever screened from this world – that looks and behaves, for the most part, just like the world we live in – because it is temporally distant from us. For example, fiction, in movies, is easily understood by almost everyone because we read the movements of an actor on screen almost exactly like we apprehend a fellow human being in real life: in most situations, I interpret “tears running down the face of someone” as crying, be it in a movie or in real life. This is the main reason why story-centric cinema (the Hollywood kind in particular) is such an accessible art form: no need to learn a grammar, a pictorial or a theatrical convention, how to use a controller, or anything, really. All you need is a basic understanding of human behaviour (at least, this is all you need to understand the story, but reading deeper into a movie requires more insight). It’s this similitude with the world as we know it and the world depicted on screen that makes us “ontologically unrest”: in a movie, we recognize the world, since the photographic image preserves the appearances of an object, which looks on film as he would appear to us in real life, but this world viewed is forever out of reach. This is where the mechanical indifference of the camera plays a role: we can speak of the world, and not of “another world” or even of “the world as represented” because of our belief that when reality is printed into film and then projected on the screen, nothing intervened to modify, alter or in any way transform the reality depicted (obviously, this belief has been strongly challenged in the last twenty years). The main difference between the world on screen and the “real” world would be that we cannot interact with the former, that we can only experience that world as spectator from a distant point in time. In this way, cinema questions us about our own situation in space and time (hence Cavell presentation of film as a “moving image of skepticism”, but this is another discussion). And because of this unbridgeable distance, with film we’re condemned to be spectators: we cannot influence something that has already happened. This idea of a “world past” is more difficult to understand nowadays, with our DVDs, multiple screens and the ubiquity of moving images; we tend to forget that there was a time, not so long ago, when the only way to experience cinema was to go in a dark theatre, try to arrive in time because the movie would not wait for us, nor stop when we needed to go to the bathroom, and it was probably the only chance we would have to see that damn movie. The passage from this unique experience to the always-there possibility offered by the VHS in the 70’s is more profound than what we usually acknowledged. Like Jacques Aumont said in his essay Que reste-t-il du cinéma? (What remains of cinema?, 2012), more than the digital advent, I think the most radical novelty of the past forty years is this still quite new possibility that we gain with VHS to “Pause” a moving image. We have to remember that all classic film theories have been thought of with this perspective of cinema being only possible in the dark room of the theatre, in a pre-determined space and time, and with a crowd of unknown persons. There was even a time, rarely remembered, when newspapers didn’t publish movie schedules: theatres had a run of two movies alternating with news clips and cartoons and this program ran continuously, from morning to evening. Thus the expression going at the movies, instead of seeing a movie: people were going in and out of the theatre at all times, sometimes entering randomly, and so may saw the end of the film before its beginning two hours later, with another movie in-between. Or they could stay all day and watch the same movies again and again. When you entered a theatre in the 50’s (this tradition continued until the early 60’s), there was a good chance that a movie was already running, a scene in progress, characters in motion; images had a life of their own. 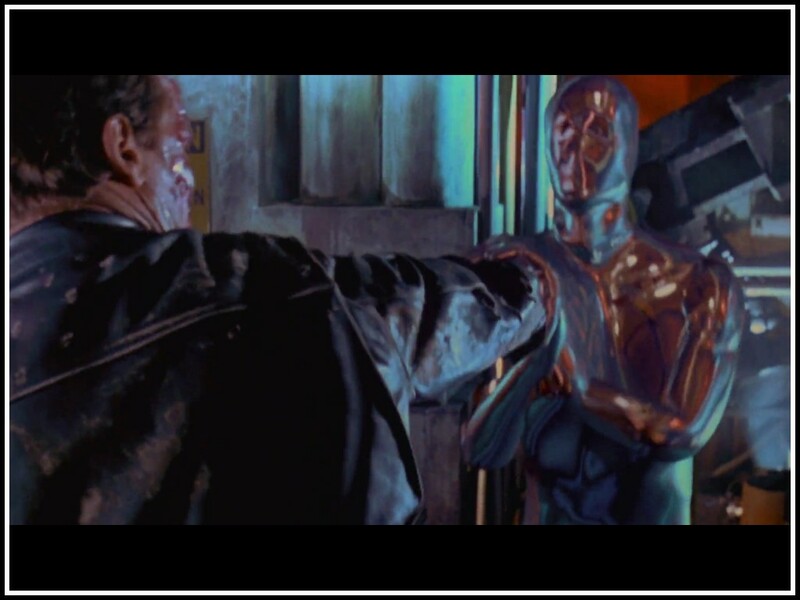 Coming back to Terminator 2, we could make a comparison with the project of the T-1000: erase the past to preserve the eternal present of the machines he represents, just as CGI threatens the essential relationship between cinema and past time. It’s important to understand that it’s only a “threat” from the perspective of photography: a Pixar movie or a video game is not a threat to anything because their aesthetics are consistent, unified. Both CGI and the photographic images of cinema are forms of moving images, but their ontology is completely different, if not downright antagonist; Terminator 2 is not a movie about CGI, but about the difficult conciliation of CGI with photography. The distinction is important. CGI is not evil: it is what it is, and like any medium it can be used to wonderful effect. And when I write that CGI threatens photographic images, I do not mean that cinema is dead, only that cinema as we knew it is pretty much a world past by now. So, in order to get a better understanding of this CGI, and why we want to interact with its images, let’s leave cinema behind and turn our attention towards the future of moving images: video games. The more you develop your ideas here, the better the thread is becoming. The discussion of ‘pause’ here alone is fantastic! Regarding Cavell’s ‘world past’, I’d like to briefly mention Walton’s idea that we ‘see through’ a photograph (i.e. we see through it to the circumstances of the taking of the photograph). This transparency thesis is incredibly simple, but I find it very useful in distinguishing film and photography from CGI and its ilk, because CGI is not transparent, and we *never* see through it. Oh, one small thing: in English, it would be “going *to* the movies” not “going *at* the movies”, although the point you are making remains apposite. Great observation. I’ve spent a lot of time wondering about the endgame of cheap, accessible photorealism: Absolute propaganda. Baudrillard talks about the war that never happened, as all perception of it was constructed from mediated images. Soon, that can be literal. Photo-real, on-the-fly online rendering/compositing means Eurasia can change allegience mid-sentence, with pictures to prove it. One day, a hologram of Ronald Reagan will be re-elected. Thanks again! Walton “see through” is quite similar to Godard’s idea (well I think it’s Godard) that every movie (on film) is his own making off, since the images take us back to the circumstances of the shooting, as you say. I’ll keep Walton’s phrasing in mind. It is, indeed, useful! For the propaganda: the development of photorealist CGI was pushed by two major entities: the entertainment industry (mainly Hollywood and now video games) and the army (for simulation programs). So, yeah, a hologram of Ronald Reagan may well be possible. (Although I’ll say photorealism is still a wonderful artistic tool; as with everything, its worth depends on how we use it). I believe that our perception with an image changes in many ways. Everything that we know or, EVERYTHING from the past to the present (the present that is moving forward continuously) is what makes us experiencing what we have now. Of course, the way we go to the the movies, or the way we watch a movie has changed. Obviously, it affects the experience. But how does it affects the experience? It could affects in the way you describe in this post. The «world past» you mentioned concerns the reality of an image (or maybe our perception about it?). Is CGI or all the mechanical part of a film more true to reality?. Do we really feel more real about Ed Wood’s ovni than when Iron Man is flying in the city? Do we questioned what we see as real or fake in a movie? Is it important? Of course, as we know the inside out of a film, it changes our experience of a film. Some people didn’t believe that people in Crouching Tiger were actually in those trees fighting. Some people believe that there’s a lot of CGI in the Batman movies. Of course, the use of CGI makes us ask about his existence in a frame, something we wouldn’t do before (as if we were asking about the existence of God…). How deeply the photographic image of a film changes our experience when it comes to CGI? As we accepted what’s in the frame, we accept to move on to the next frame. This is less true when it comes to believe IN reality (the media, or historical image for example). But, for an image of a film, we already tend to believe that it is a creation of someone’s imagination. The truth remains in the authentic experience of a viewer. My experience of The Tree of Life on Blu-ray is not the same as if i watched it on the big screen but the «world past» has so little to do with it. Like you said, CGI is a medium. I prefer to say that it is another tool to communicate. Whether you add graffiti to an old historical building or rebuild a building to make it look exactly as if it was from the past, there is something interesting about art or life, it’s that we experience what we see in the ways of how we get there. I’m really looking forward for your next post on CGI. Those are very good questions! Most of them are actually the very subject of my next post (especially the “how does it affect our experience?” part). It’s turning out to be a very long article (like 8000 words…), and I’m struggling to put it together in a satisfactory fashion, but I’m almost done. I’m hoping to put it online sometimes this week. I’m talking about our perception: the key word is “belief”. We believe in the reality of a photographic image, but our belief is not always well-founded. And the possibility of CGI changes this belief: it doesn’t really matter whether there is CGI or not, because we can never know these days. Your examples of Lee and Nolan are telling exactly that: even if there’s minimal CGI in those movies (or none at all? ), people don’t believe that they correspond to a “world past”, because we’re used to CGI and we assume that filmmakers must have use it. I’ll leave it at that for now: this is an important part of my next article (as is the question about Blu-ray vs theatre). If I may: did you come to this blog from its French counterpart? Or a newcomer? I use to read you at Séquences.